Marvel's Black Panther has taken the movie world by storm, with a massive $235M four-day run over President's Day weekend that has everybody talking, even one former First Lady. Earlier this morning, Michelle Obama took to social media to offer her congratulations to the entire Black Panther team for their amazing success, while offering some high praise of the movie itself. 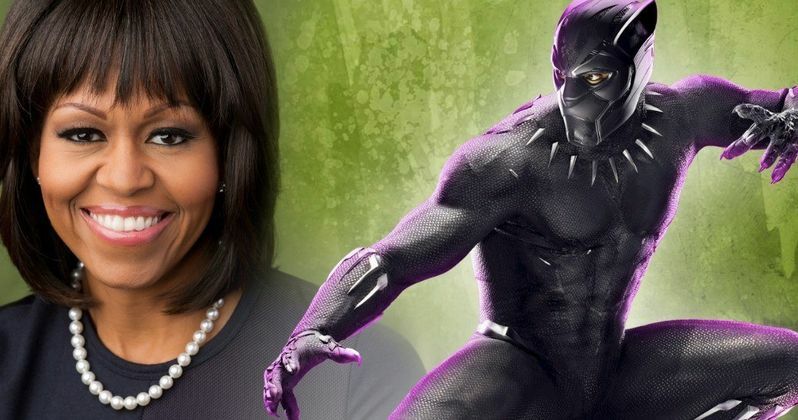 Here's what Michelle Obama had to say about Black Panther this morning on social media. "Congrats to the entire #blackpanther team! Because of you, young people will finally see superheroes that look like them on the big screen. I loved this movie and I know it will inspire people of all backgrounds to dig deep and find the courage to be heroes of their own stories." Michelle Obama is just the latest to offer high praise of the movie, which had an incredible 100% Fresh rating on Rotten Tomatoes when the first wave of reviews from critics were released, and while it's dropped some since then, its current score of 97% is most certainly impressive. Its three-day tally of $201.7M is the fifth highest debut of all time, shattering the February opening weekend record of $132.4M set by Deadpool two years ago, and the $235M four-day tally is the third highest of all time, behind Star Wars: The Last Jedi ($241.5M) and Star Wars: The Force Awakens ($288M). With no competition from the DCEU or any other superhero movies opening between now and Marvel's Avengers: Infinity War on May 4, Black Panther could be en route to a historic box office run, if it keeps posting minimal decreases from weekend to weekend, which would likely rely on repeat viewings. While the opening day tally of $75.8M wasn't nearly as big as the record of $119.1M set by Star Wars: The Force Awakens, it only posted decreases of 13.1% on Saturday ($65.8M) and just 8.8% on Sunday ($60M). It dropped an estimated 44.8% for its Monday estimate of $33.2M, which is the second highest Monday gross behind Star Wars: The Force Awakens ($40.1M). The movie has earned an additional $169 million from international markets bringing its worldwide total to $404M, with the movie slated to open in a number of additional international markets over the next few weeks. The most important of these markets is its last, China, with the movie slated to debut in the Middle Kingdom on March 9. That could provide a big bump to the global haul, with the last MCU movie, Thor: Ragnarok, faring quite well in China, pulling in $112.2M. Marvel's other two 2017 movies also fared well in China, with Spider-Man: Homecoming pulling in $116.2M and Guardians of the Galaxy Vol. 2 earning $100.6M. While Black Panther did out perform both of those movies with its domestic opening, it will be interesting to see how Chinese audiences respond to Black Panther. Take a look at the tweet from Michelle Obama Twitter below, as Black Panther continues to build off its impressive opening weekend.